Situated on the east side of Hartbeespoort Dam, Villa Paradiso has a magnicifent view and is surrounded by natural vegetation and spectacular scenery. Villa Paradiso is a multifunctional venue, catering for various occasions. Ample Secure parking is available and a safe environment is provided for guests. Our stylish unique Bell Room and Restaurant venues with breathtaking views caters for 20 - 180 people. The Garden Marquee surrounded by rose trees and lush green gardens can cater for up to 300 people. 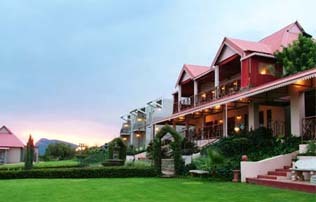 Situated in the lush beautiful English gardens of Villa Paradiso, with a spectacular view of the Hartebeespoort Dam. Perfect for any outside function and wedding. Pledge your love in a peaceful, romantic atmosphere in our exquisite chapel. The chapel with its special atmosphere can accommodate up to 150 guests. The tranquil surroundings is perfect for seminars, workshops etc. Multipurpose conference centers and entertainment rooms. Suited for any function. Excellent service. Teambuilding and Leisure trips include Cheetah Farm, Cableway, Boating trips and the Elephant Sanctuary. ADSL Connections and WIFI hotspots are also available. Our highly skilled chef's prepare mouthwatering food of the highest international quality in large efficient kitchens. A huge variation of buffet and sit-down dinners are available. All our menus are customised to suit your requirements and your budget. Please contact us for a free quotation. Luxury accommodation available for staying over after that special function or wedding. 25 Double or Single rooms are available.